All compositions by Barry Altschul, except for "Ictus" by Carla Bley. 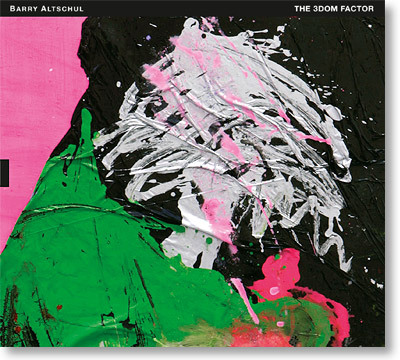 The 3dom Factor is the first new album under the leadership of master drummer Barry Altschul in over a quarter century. In this new trio, Altschul, a veteran of highly influential groups with Paul Bley, Anthony Braxton, Chick Corea and Sam Rivers, among others, is joined by Jon Irabagon, one of today´s leading young saxophonists particularly known as the leader of his own groups and as a member of Mostly Other People Do the Killing, and bassist Joe Fonda, Altschul´s companion in the FAB Trio with late violinist Billy Bang, a veteran of Anthony Braxton´s groups and a leader or co-leader of many of his own ensembles. All compositions, except for Carla Bley´s "Ictus", are by Altschul and represent a cross-section of his career ranging from compositions included on his solo albums in the late 1970s and the 1980s, one composition originally created for the FAB Trio and three new tunes.